Located in the scenic Colva Beach in Southern Goa, William Beach Resort is an ideal destination for de stressing yourself and enjoying your vacation in the midst of nature. William Beach Resort provides you with plush accommodation, good dining experience and fine hospitable services. 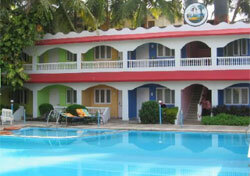 There are 36 well furnished and spacious rooms in William Beach Resort, Goa. All modern facilities are incorporated in the rooms for a hassle free stay. 20 rooms are in the main block while the other 16 rooms face the swimming pool. Bambooze is the in house theme restaurant in William Beach Resort, Goa. The whole ambience of the restaurant emits an aura of laid back life and gaiety. It provides wide varieties of Sea food items and Goan cuisines. You can also take your pick from Indian, Chinese and Continental dishes. * Open roof top terrace for sun bathing and sit out. The best time to visit Goa is during the Carnival in winter. The laid back cities of Goa come to life during this time and are celebrated with aplomb and gaiety. The spicy Goan cuisine and fresh seafood selection gives you the true essence of this beautiful state.